olf Hansen’s symptoms started about five years ago with subtle changes to his memory: paying the same bill twice, mailing an envelope with nothing in it. By the time Rolf and his wife, Linda, relocated to Oak Hammock at the University of Florida from Maine in 2015, his memory issues were starting to take a toll on their relationship, Linda said. Rolf, a retired high school history teacher, was becoming more frustrated by his memory problems, and Linda, a retired nurse midwife, felt at a loss for how to help. Rolf’s physicians chalked the changes up to normal aging. Fortunately, last fall they heard Glenn E. Smith, Ph.D., speak at Oak Hammock about Healthy Action to Benefit Independence & Thinking, or HABIT®, the program he developed to help people with mild cognitive impairment maximize their cognitive function. “We were totally impressed,” Linda said. 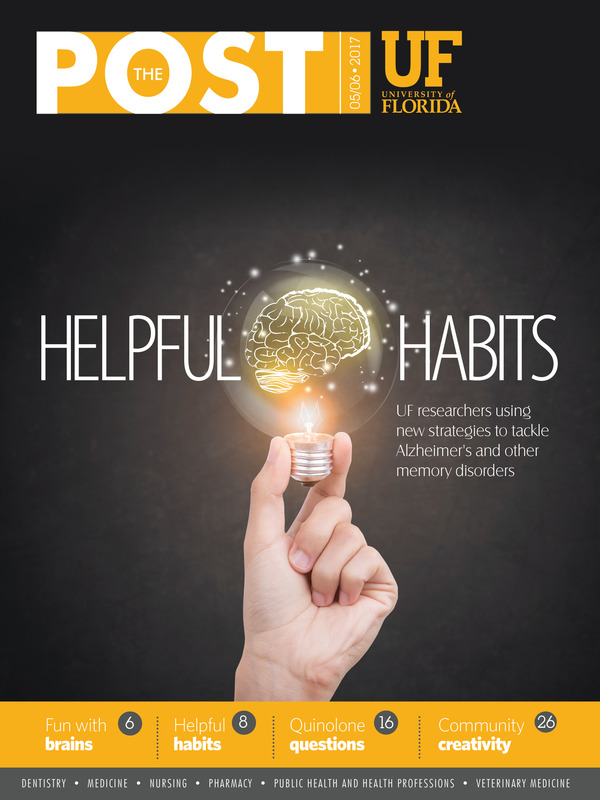 During his more than 25 years of Alzheimer’s disease research, Smith, the Elizabeth Faulk Endowed Professor and chair of the department of clinical and health psychology in the UF College of Public Health and Health Professions, has seen a dramatic shift in the way scientists view the condition. Among the pieces of evidence that point to this possibility is a study by Smith and colleagues that tracked memory function in older adults over a period of years until death. Several participants consented to having an autopsy performed and researchers were surprised to discover that the brains of 15 to 20 percent of these people had the plaques and tangles characteristic of Alzheimer’s disease, yet those individuals exhibited no signs of dementia in life. Smith also points to findings of the Framingham Heart Study, which has been studying the health of Framingham, Massachusetts, residents since 1948. With each generation of older adult participants, the rate of dementia has decreased. — Glenn E. Smith, Ph.D. In the 1990s, Smith and fellow researchers at the Mayo Clinic developed tests to recognize the earliest signs of memory problems in older adults, a condition they called mild cognitive impairment. People with the condition are at increased risk of developing Alzheimer’s disease or another type of dementia. The diagnostic criteria established by Smith and his colleagues have been cited more than 7,000 times in the research literature and influenced the Diagnostic and Statistical Manual of Mental Disorders. But at the same time the diagnosis was gaining wide acceptance, the team’s work had its critics, Smith said. Smith believed that it was possible for patients to take action to prevent or delay memory loss and he looked to interventions being used to help patients with traumatic brain injury as a guide. Several treatment programs had had success with training patients to habitually use calendars and take notes to compensate for memory problems. “The first thing we needed to do was blow up the idea that just because someone is going to get worse, doesn’t mean you shouldn’t help them,” said Smith, drawing a comparison between dementia and his father’s pancreatic cancer. “I am learning to be patient. I won’t say that every day is bliss because he still can get frustrated and I still sometimes get snarky, but we’re just worlds better. This is life-changing for us"
Smith developed the program at Mayo to tap into patients’ procedural, or habit memory, to teach or strengthen the use of calendar and note taking. Procedural memory is the kind of memory that prompts drivers to push in the clutch when driving a standard transmission vehicle, for example, without conscious thought. This memory system is also largely intact during mild cognitive impairment. “We recognized the value of the mild cognitive impairment diagnosis is that people can still acquire new skills even if they couldn’t remember that they are acquiring them,” Smith. The program combines the calendar and note-taking training with other interventions that have shown success in improving cognitive function, including computerized brain fitness training, group therapy, yoga and wellness education. Patients who have recently been diagnosed with mild cognitive disorder and a partner attend 50 hours of programming over a 10-day period. Studies of the program’s impact have shown that six months after treatment, participants are still functioning as well as they did when they started. Following Rolf’s mild cognitive impairment diagnosis, Rolf, 83, and Linda, 78, participated in the program last December along with several other couples. They still religiously use the calendaring skills they learned from clinical and health psychology intern Janna Belser-Ehrlich. Rolf and Linda each maintain a calendar, which they review together every morning. The calendar is designed to not just list daily events, such as doctor’s appointments and dinner dates with friends. It also includes an area to record action items — “Things to be done today” — and important pieces of information collected throughout the day — “Things I want to remember.” Before, Linda said, Rolf might get off a phone call and Linda would ask him what was discussed. “I don’t remember,” was often the reply. With the calendar in front of him, Rolf jots down conversation notes. Now, his memory issues feel more manageable. “This doesn’t mean I don’t forget things, because obviously I do, but if I write it down I have a way to refer to it and it keeps me on track,” he said. Rolf and Linda agree that one of the most positive outcomes has been the effect on their relationship. They both have a better understanding of what each other is going through and have learned coping skills and tips for positive interactions from Belser-Ehrlich. Linda admits that in the past it was hard not to give a “snarky” response when Rolf asked her a question he may have asked 10 minutes before. Rolf and Linda went on their first cruise in February with other Oak Hammock residents, a trip made less stressful because of skills they learned, and they are hooked on the cruise experience. The year 2019 marks their 60th wedding anniversary, Rolf’s 85th birthday and Linda’s 80th birthday, a perfect reason to make a trip with their daughters to Rolf’s ancestral home. “I have only one thing on my bucket list and that’s cruising the fjords of Norway,” Rolf said. Findings from the program and the study of older adults who had pathological changes associated with Alzheimer’s but no symptoms of dementia, as well as many other studies, demonstrate the importance of cognitive reserve, Smith said. A lifetime of mentally stimulating experiences, including educational, occupational and leisure activities, can help the brain resist damage that can come with aging. “That’s one of our challenges, getting people to engage in active coping and not merely sit back and wait for the pill that is, right now, nowhere in the pipeline,” Smith said. Smith and his colleagues are conducting a comparative effectiveness trial of the individual components of the program to determine their effect on daily function, cognition, quality of life, mood and self-efficacy in patients and caregivers. The study is supported by a more than $2 million grant from the Patient-Centered Outcomes Research Institute. Smith and his team have also recently received an Ed and Ethel Moore Alzheimer’s Disease Research Program grant from the Florida Department of Health. The $450,000 award will be used to establish a collaboration between the Florida Department of Health-funded memory disorders centers at UF, Mayo Clinic in Jacksonville and Tallahassee Memorial HealthCare to study the neuroimaging impacts of behavioral interventions in people with mild cognitive impairment. What can I do on my own to maintain cognitive function with age? It is a question Glenn E. Smith, Ph.D., hears frequently. Exercise should be intense enough to modestly raise heart rate and respiration. For older adults, yoga, as used in the HABIT program, is vigorous enough to fit the bill. Brain games can be valuable, but challenge yourself, Smith said.